As Diwali giveaways go, what can be better for a motorhead than receiving the gift of a brand new car. Now, imagine 600 of your colleagues receiving such a gift along with you! That is exactly the feeling that lucky employees of Surat-based Hare Krishna Exporters felt this past weekend. 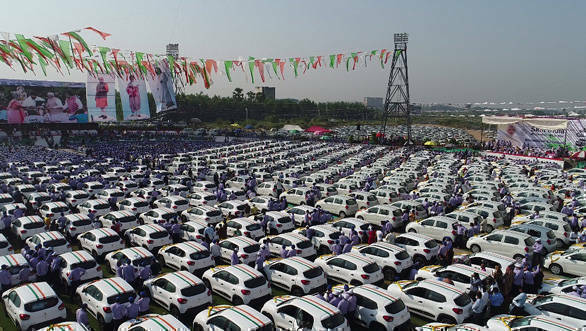 Of the 600 cars given away to employees for Diwali by founder diamond merchant Savji Dholakia, 400 are Renault Kwids. That's one tempting Diwali bonus. The Renault Kwid is a compact India-specific model developed by Renault. It features 98 per cent localisation in production and is the perfect example of the 'Make in India' campaign. 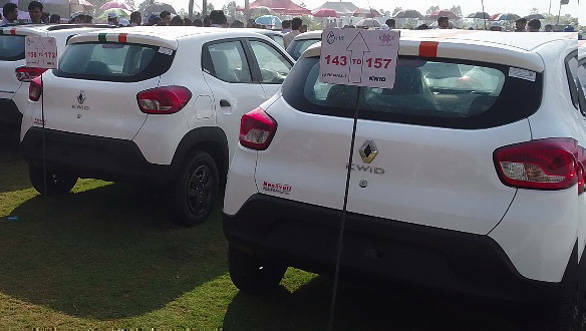 The Kwid was originally launched in India in 2015, and it was only recently that the updated 2018 Renault Kwid launched in the country in August 2018. The new 2018 Kwid also packs in new features including integrated reverse parking camera, rear seat armrest and a 12V socket. The Renault Kwid is available with manual or AMT gearbox options powered by either 800cc or 1-litre SCe petrol engine variants. The Kwid has proved a popular vehicle for Renault, selling about 2.5 lakh units since its introduction in the country in 2015. The biggest distinction on the 2018 Renault Kwid exterior of the SUV-inspired design is the new razor edge chrome grille. There are various other new features including a 7-inch touchscreen Media Nav system, digital instrument cluster, one-touch lane-change indicator, and speed-dependent volume control. The top variants on the Kwid also feature manual AC, passenger side ORVM, engine immobiliser, Bluetooth integration, front speakers and a 12V power socket. Renault India offers the Kwid in six paint options - Fiery Red, Planet Grey, Moonlight Silver, Ice Cool White, Outback Bronze and Electric Blue. The Renault KWID comes with a 4 year / 1 lakh km (whichever is earlier) class-leading standard warranty along with roadside assistance. This includes the regular 2 years / 50,000 km comprehensive warranty along with an additional 2 years / 50,000 km extended warranty, enabling customers to enjoy an unparalleled ownership experience.